SBench 6 is capable of doing a lot of calculations on the acquired or loaded data. Calculation results as well as cursor measurement functions are shown in the information window. Calculations can be used on different data types. 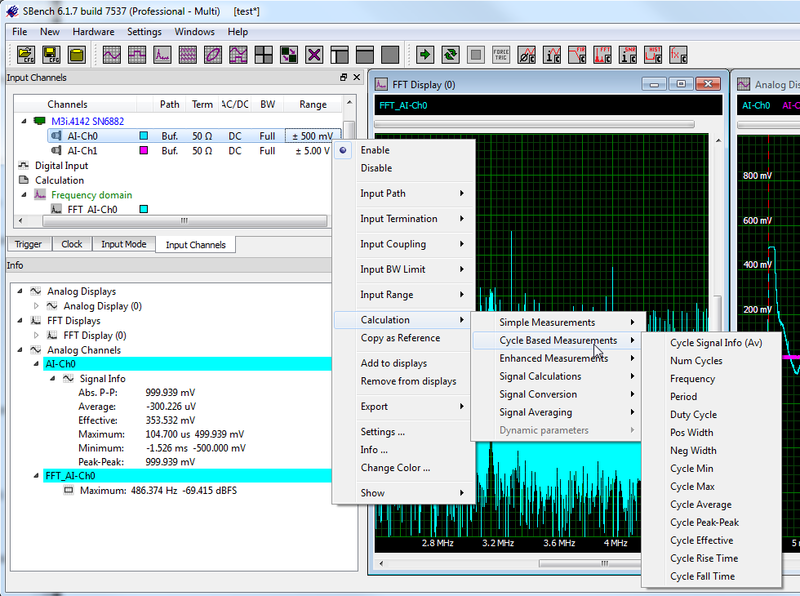 All calculation functions can either work on a whole signal, a signal part visible in a display window or on the signal part that is in between the measurement cursors. Using this technology one can exactly define which part of the signal is used as a source for the calculation. SBench 6 is permanently enhanced by new calculation functions. Please check the latest software version to have access to all calculation functions. We at Spectrum are always open to add new calculation functions on customer request. Please check with our team what additional calculations are possible if you have the need for something not yet implemented.